Last weekend we made our triumphant return to the very top of Scotland and my favourite village… TONGUE! You may remember our last trip to Tongue and the bazillion photos I’d taken of signs that said TONGUE this and TONGUE that. Turned out I’d missed one! We also popped by the Clava Cairns. They date back to 2000BC but they’ll be more remembered by us as The Place Where Shauna Did An Enormous Fart That Echoed Through The Trees, Not Noticing The Elderly American Tourist Standing Behind Her. But back to Tongue. We ate dinner in a pub beneath the Tongue Hotel, where the locals played darts and spoke with bizarre accents. They were such decent folk that the barwoman wandered off for twenty minutes and nobody stole anything! Not even a wee bag o’ pork scratchings. That wouldn’t happen where we live. We stayed in a lovely B&B that served delicious breakfasts with Madonna’s Greatest Hits playing in the background. Our room became slightly less lovely when I stupidly opened the window to let in some fresh air. A giant black cloud of midges immediately stormed in. D’oh! So we spent the next ten minutes swearing and thrashing the air with towels, in the hope of snuffing out the little biting bastards. And then a further ten minutes was required to wipe their smeared corpses off the walls. But it was too little too late. I was awoken on Sunday morning by the sound of my own fingernails frantically scratching dozens of giant red lumps all over my body. And let me tell you, those little shits are NOT shy about where they bite. After breakfast I picked up some souvenir I HEART Tongue fridge magnets for my colleagues, then we crawled along a single-track road to Durness. Oh baby! Caves! Sheep! Pristine sea and spectacular white beaches! And the sky was more blue than a pervy old man’s video collection. Scotland is so breathtakingly beautiful it just makes your bones ache. I’m aware this has been a What I Did On My Weekend blog lately, but it’s summer and one has to turn off the computer and go forth and Do Stuff because soon it will be too dark and depressing to get out of bed. Rather than ramble on further, go forth and check out the photies! They have glowing captions too, so you can see I am doing my bit for Scottish tourism and not just slagging off the food! The head of the Scottish Tourist Board thanks you. And don’t you look slim! after our 3 days in Edinburgh last year I knew we wanted to come back, and now given your pictures I’m thinking a second honeymoon in Scotland is in order. It looks amazing. Dan and I are planning a little pilgrimage next summer. My mother’s family are all Scottish (weegies). We’ve been to Glasgow a couple of times and to Edinburgh for the Tattoo with Dan’s folks a couple of years ago. But I want to see the Highlands. And some of the Islands. The only bummer is those damned midges that everyone moans about. The photos look fab. The coast reminds me so much of NZ. Sandra’s right! So many of those photos look like New Zealand. Especially the one with the sheep. The secret is to go when the midges are out of season. I’ve been to Tongue too and never got bitten by a midge once. Unfortunately I did attract a few ticks and the not the type that mean you’ve done your homework well. Early May or September would be safe times to go. Great photos – I missed Tongue on my trip to Scotland – maybe next time. Gotta love places with funny names. I grew up close to a town called “Iona Station”. Every time we drove by, my brother and I started in on the “Iona car”, or Iona dog etc. etc. My parents started taking a different route! My desk is covered with photos from our trip to Scotland – the scenery is so breathtaking! Ahhh Tongue. I vaguely remember it but I was very young when my parents took me for a week in a caravan up there. Apparently my Uncle Bill got so drunk one night he ended up crawling down the middle of the road… completely lost when the tarmac ended! The scenery looks fantastic and so do you! You are so slim! > Scotland is so breathtakingly beautiful it just makes your bones ache. That’s exactly what I think… only I wouldn’t have been able to put in in such beautiful words. 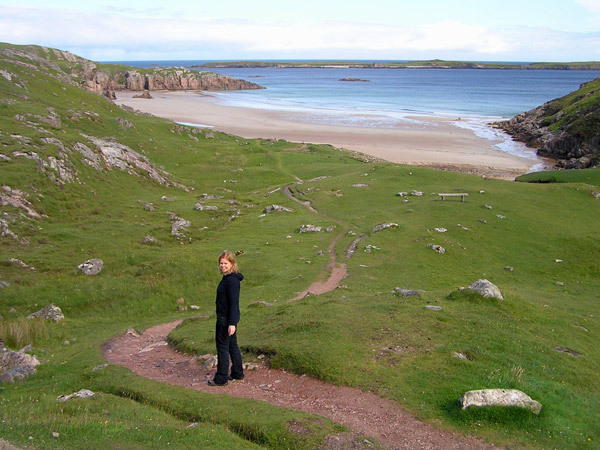 I spent half a year on the Isle of Mull and absolutely fell in love with Scotland. Is it possible to feel homesick for a place you don’t come from and have only ever spent 6 months in?? I wanted to use your “still on the beach” pic from the Flickr page as background on my computer’s desktop, but when I said “save as” all I got was a white square. Is that because of some copyright reason (meaning you can’t just download people’s pics)?? If so, could you email it to me, pleeeeease? The way to avoid midges is to go to the countryside (where midges are particularly keen on gathering) when the weather in Scotland is hot and dry. No problem! Well, don’t leave us hanging…did you stop in at the Heath Center and get your tongue checked? Tongue health is VERY important.